The field of stem cell research offers lucrative career options for people looking for something different in the field of medical science. Stem cell research is emerging as one of the most viable career options for youngsters, willing to take on a variety of challenges. Let us first understand why stem cell therapy or regenerative therapies are often dubbed as the “Future of Modern Medicine.” Stem cells are found in the body’s organs, tissues, blood, and immune system and have the ability to regenerate into additional stem cells or differentiate into specialised cells, such as nerve or blood cells. This remarkable ability makes them invaluable in medical treatment. Stem cell therapy, also known as regenerative medicine, promotes the reparative response of diseased, dysfunctional or injured tissues using stem cells or their derivatives. It is the next chapter in organ transplantation and uses cells instead of donor organs, which are limited in supply. Researchers grow stem cells in a lab. These stem cells are manipulated to specialise into specific types of cell, such as heart muscle cells, blood cells or nerve cells. The specialised cells can then be implanted in a person. For example, if the person has heart disease, the cells could be injected into the heart muscle. The healthy transplanted heart cells could then contribute to repairing the defective heart muscle. So, what exactly does stem cell research involve? It is an advanced level of scientific research carried out by people from diverse science backgrounds to find new and efficient therapies for various ailments. The next level after stem cell research is stem cell therapeutic procedures. Stem cell treatment or therapy refers to introducing new adult stem cells into damaged tissue to treat a particular type of disease. For instance, stem cells from the bone marrow, adipose tissue and umbilical cord (embryonic stem cells) have been used to treat many chronic diseases. Stem cell therapy also holds the potential to treat a variety of other serious ailments such as Type 1 diabetes mellitus, rheumatoid arthritis, Parkinson’s disease and a variety of cancerous conditions. The field of stem cell research and therapy offers lucrative career options for people looking for something different and revolutionary in the field of medical science. Key areas where stem cell therapy can result in effective treatment are Neurological conditions, Orthopedics, Chronic Kidney Diseases, COPD and other Lung diseases, Liver Diseases, Cardiology, Autoimmune disorders, Ophthalmolic diseases, Infertility and Cosmetic Procedures. There is a general misconception that only people with medical education can be employed in stem cell therapy. In fact, students of basic biology too can find jobs in stem cell research and therapy. B.Sc graduates with at least one subject of biological sciences, MBBS, B.Pharma, B.D.S., B.V.Sc. or B.E. Biotechnology students can find jobs in the stem cell research domain. 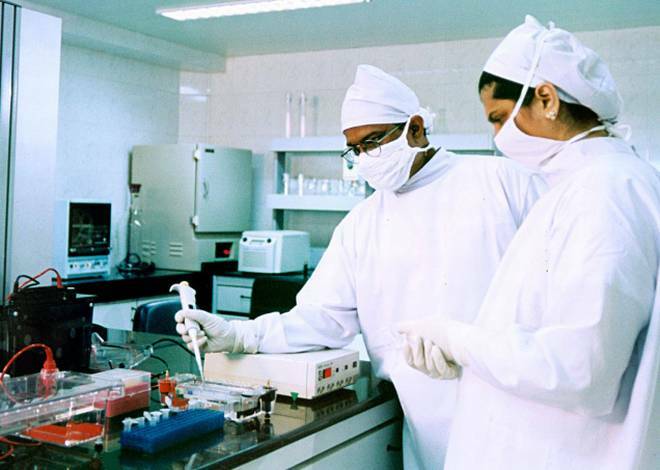 The stem cell therapy market in India was valued at Rs. 1 billion in 2013; this is expected to reach Rs. 2 billion by the year 2018. India is projected to witness a rise in the number of stem cell banks and stem cell depositors in the near future. Liberalisation of stem cell research, and government support, are the major factors aiding this growth gradient. Stem cell banking, which was unheard of a few years ago has become popular in the recent past as a relatively less traumatic alternative to treat neurological conditions. This emerging branch of regenerative medicine needs quality, skilled and trained manpower. With the global market expected to touch US $40 billion by 2016, excellent career opportunities will be available to post graduate students from diverse fields. India is a major biotech player in the Asia Pacific region, coming next to Japan and South Korea. Malaysia is also catching up. Karnataka, and Bengaluru in particular, is a major hub in work related to stem cells. Students in Europe, Australia, the U.S. and now, even in India, have the option to pursue their research career in developmental biology, tissue engineering, embryology, medical biotechnology, molecular biology, cell biology, nanotechnology, clinical research and stem cell biology. It provides multiple options to the students to even pursue higher studies in basic biology and applicative translational field. With the large number of pharmaceutical and biotechnology companies and prominent stem cell institutions carrying out pioneering research in stem cell therapy, the opportunities for students are immense. It is estimated that the investment in stem cell research in India is more than Rs. 1,000 crore. There are several opportunities for science graduates to pursue a career in stem cell research and therapy in India. From a doctor to a lab assistant, opportunities are plenty and highly rewarding. There are several institutes that offer skill training in this field of medicine. Some of the institutions that offer stem cell courses are: Indian Institute of Science, Bengaluru; National Centre for Biological Science (NCBS), Bengaluru; National Centre for Cell Science (NCCS), Pune; National institute for Research in Reproductive Health, Mumbai; Manipal Institute of Regenerative Medicine (MIRM), Bengaluru; Centre for Cellular and Molecular Biology (CCMB) Hyderabad; Indian Institute of Technology, Madras; National Institute of Nutrition and National Institute of Immunology. Aspiring candidates today have the option of pursuing the following courses: M.Sc in Biotechnology, Biochemistry, Genetics, Zoology, Biophysics, Microbiology and Life Sciences; M.Sc in Regenerative Medicine is only available at MIRM, Bengaluru. One can choose to start one’s career in quality, R&D, production, clinical research, supply chain and human resources besides finance and other administrative functions. As a beginner, an eligible postgraduate can earn up to Rs. 30,000 per month and after obtaining a PhD one can earn more than Rs. 50,000 per month. When Ph.D holders are recruited abroad as postdoctoral fellows, they can earn, around US$ 35,000 to 40,000 or Euro 25,000 to 30,000 annually.